Version 2 is here and it’s a HUGE update! One of the most striking new features in iSymphonic 2 is the new sound selection screen. The sound selection combo box is still at its old place, but when you tap on it, the list of sounds pops up in full screen. Additionally this new sound selection screen provides various interactive filter options, located at the very top of the screen, which help you to find your sounds in a very easy and quick way. Keywords: Enter arbitrary search keyword(s), either with the on-screen text input keyboard, or with an external wireless Bluetooth keyboard. While you are typing your search keywords, the list automatically updates in real-time, showing you just the sounds that match you search criteria, which may be anything like the sound name, the (real) instruments contained in the sounds, articulations, or anything else related with the respective sound. Obviously while you are on the road, or even on stage, you probably don’t have a Bluetooth keyboard with you and don’t want to fiddle with the on-screen text keyboard. That’s why the other 4 filter categories provide you each an interactive list of options instead, which you can quickly scroll and tap to find your sounds. You will notice that those lists with options will update in real-time as well, options which are already ruled out by your current search criteria are automatically grayed out. Instruments: Use this list to easily tap on (real) instruments which should be contained in the sounds you are looking for. 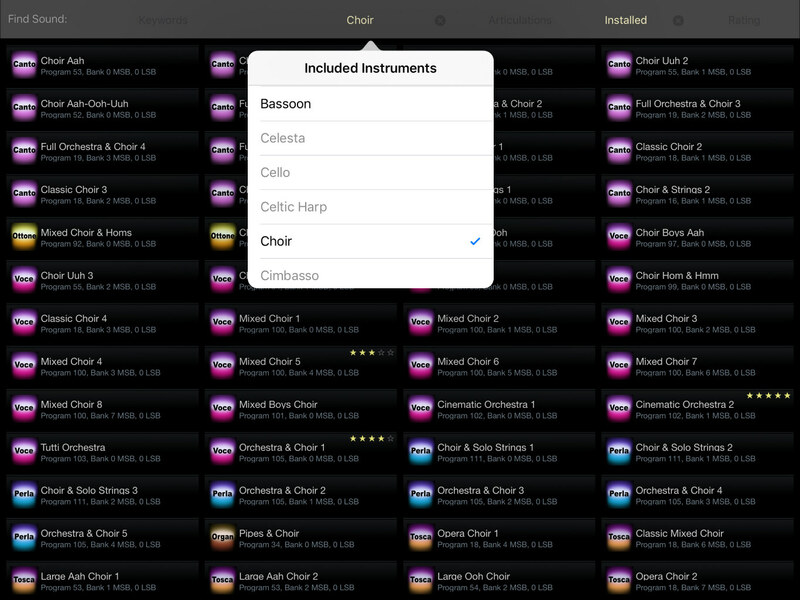 You may select more than one instrument from that option list, for example tap on “Choir” and “Bassoon” to find all sounds which at least contain a choir and at least one Bassoon player. Articulations: Use this list to select the playing style, typically referred to as “Articulations” by musicians, which should be covered by the sounds you are searching for. For example by selecting “Staccato” it will show you sounds which cover this particular playing style of short and significantly loud notes. Status: This option allows you to define whether you are interested in all sounds provided by iSymphonic Orchestra, or whether you only want to search among the sounds you currently really have installed on your device at this moment. User Rating: iSymphonic now also allows you to rate the individual sounds, which is described a bit more down later. This option category allows you to search for sounds which were already rated by you with at least the hereby selected amount of stars. You may use any number of those search categories. If you use multiple search categories simultaniously, then only sounds are listed which match all of your chosen filter options from all your filter categories together. By long tapping on a sound from the list, a popup will appear which shows you more details about that particular sound. It also allows you to rate the quality of the sound by tapping on one of the five stars. After you rated the sound, the respective amount of stars will also be shown on the right hand side of the sound’s name in the list, which helps you to visually spot your favorite sounds directly by just looking at the list. Then you might also use the “Rating” filter option to just list the sounds which have at least the given amount of stars. For example by selecting 4 stars from this filter, only sounds are listed which were rated by you with 4 stars or 5 stars. Another aspect which we improved in iSymphonic 2 is the on-screen virtual MIDI keyboard. To be honest, we actually neglected the on-screen MIDI keyboard for quite a while. That’s because most users at the beginning only used the on-screen keyboard for sound check purposes, but rather used an external MIDI keyboard to actually play the sounds. And for a long time we thought playing seriously on a touch screen does not make sense. But our opinion especially changed with the release of the 12.9″ iPad Pro, so it was time to address several issues with the virtual keyboard. First of all, even though the keyboard looks almost identical to the previous version, it has been completely rewritten from scratch. With the previous version, people sometimes encountered hanging notes while playing with the virtual keyboard. This is no longer the case. The virtual keyboard behaves now reliable under all situations. Another thing you will notice is that the way how the keyboard is controlled, works slightly different now. By short tapping on the keyboard’s arrow button the keyboard’s tool bar unfolds and remains open. This also reveals 3 new control buttons on the keyboard’s toolbar. The “+” and “-” buttons allow you to quickly transpose the current part by octaves or semi tones steps. So it not only transposes the virtual on-screen keyboard, but also your external MIDI keyboard for example, at least if the external keyboard is meant to control the same part. To reset the transpose setting to 0, tap both buttons simultaniously. The third new button, which looks like two stacked down arrows, allows you to define how MIDI velocity shall be controlled and emulated with the on-screen keyboard. With the previous version, MIDI velocity was emulated by the impact of a finger on the touch screen. Unfortunately the precision those touch impact values were delivered, dropped significantly with recent versions of iOS and device models. 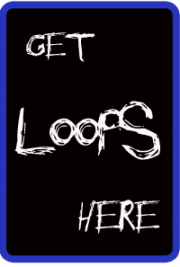 As a consequence we now introduced an alternative behavior for controlling MIDI velocity by using the vertical touch position of the finger on the respective virtual piano key, so when you tap on the bottom of the key it generates a high MIDI velocity, or tap on the top of the key to generate a low MIDI velocity. This third new button on the keyboard’s toolbar allows you to switch between those two distinct velocity behaviors at any time. Even if you are a serious, conservative composer, we really encourage you now to also use the on-screen keyboard as well! You will be surprised how many new musical ideas pop up from your mind immediately, simply because the virtual keyboard automatically kicks you out from your usual mechanical playing patterns of a real MIDI keyboard! You might have noticed a new icon on the app’s main screen, which leads to a major new feature which we call “App States”. An App State is a snapshot of the entire app at a certain point of time which you may save as a user preset. The new snapshot is added to the list of App States and you may chose any of them whenever you need them to restore the app to the respective snapshot. This feature was requested by many users and is especially helpful in live concert situations, because an App State saves and restores all sound settings of all 16 parts, as well as everything you had on the MIDI recorder screen. So with the latter you may also quickly restore backing MIDI tracks which assist you during your next live song on stage. Obviously you need some way to distinguish your individual App States, such that you can always remember easily which App State was saved by you for which purpose. Instead of trying to push that important information into a regular title text which you would need to enter with a text keyboard, we came up with the idea to handle this like musicians were used to before, back in the analogue days with real “set lists” for live shows: by using a pen. So we explicitly support Apple Pencil for allowing you to hand write and draw everything you need, and in a way you personally find appropriate to distinguish your App States in any stressful situation on stage. As you can see on the left, every App State you save is represented in the app by a rectangular paper strip which you can label appropriately. You can also assign a background color and material for each strip, so you might visually group your App States by color to visually separate them for different live shows where you perform different songs for example. To restore, edit, replace or delete an App State, simply single tap on the respective App State strip from the list of App States. The App State strip enlarges and provides you the available options. You can also arrange your individual App States in the list. Simply drag an App State strip with two fingers from its old position to its new desired location in the list. That way you can easily sort the configurations for your next shows. And of course, when your App State list grows, use the usual single finger swipe gesture to scroll the list. You don’t want to use the touch screen during live performances at all? Then assign MIDI program change and bank select numbers to your App States to restore App States remotely with a tap of a button directly at your external MIDI keyboard. iSymphonic Orchestra was designed to be very easily and intuitively usable, which also means that you should be able to use the app immediately, without requiring any software configuration. 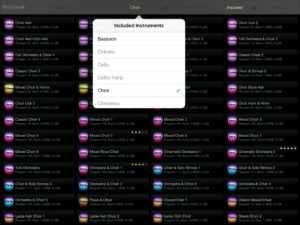 For example when you attach external MIDI equipment with your iPad, iPod or iPhone, then the app automatically connects to those devices. Now this behavior is fine especially for beginners, but we received numerous requests from you, that this is sometimes not what you want. So we addressed this issue in iSymphonic 2 by introducing a new MIDI input device selection screen. By default, the app still connects automatically to all MIDI equipment that you may attach to your iOS device. But now you can tap on the circled number of connected devices to get more control over the MIDI devices being used. This new screen shows you all the MIDI devices and all software based MIDI sources (i.e. third party Apps) currently being available on your device, and the respective check mark shows you to which ones of them the app is currently connected with. And you can now also override this automatic configuration and manually select specific MIDI devices and Apps instead. This screen also allows you to quickly pair your external Bluetooth MIDI equipment in this context, if required. We also addressed your requests regarding tuning improvements. 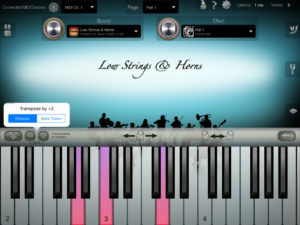 Most importantly the tuning setup screen now allows you to adjust Master Tune, which is the fundamental tuning basis to be used by the app and fulfills certain tuning requirements of professional musicians who may need to adjust their tuning to the one of other instrument players, like using 434 Hz for example instead of the standard reference tuning of 440 Hz. As you might know, iSymphonic already supports Hermode Tuning for a long time, which is a dynamic tuning algorithm that automatically adjusts the scale in real-time according to your harmonies you play, with the goal to achieve higher purity. Additionally though, iSymphonic now also supports static tuning scales. 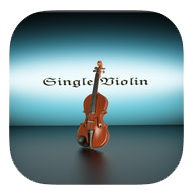 Which is needed for almost any non-western musical genre. The tuning screen also provides you a set of factory presets for common Arabic and Turkish scales. You can save all those individual tuning settings as user presets. So such a user preset stores master tune, your custom static scale, or if you selected the dynamic Hermode Tuning alogirithm instead, it stores the duning depth and the selected Hermode Tuning algorithm; altogether. Another detail we corrected: you can now use the tuning setup screen simultaniously while playing the virtual on-screen MIDI keyboard to test your tuning changes immediately at the same time. 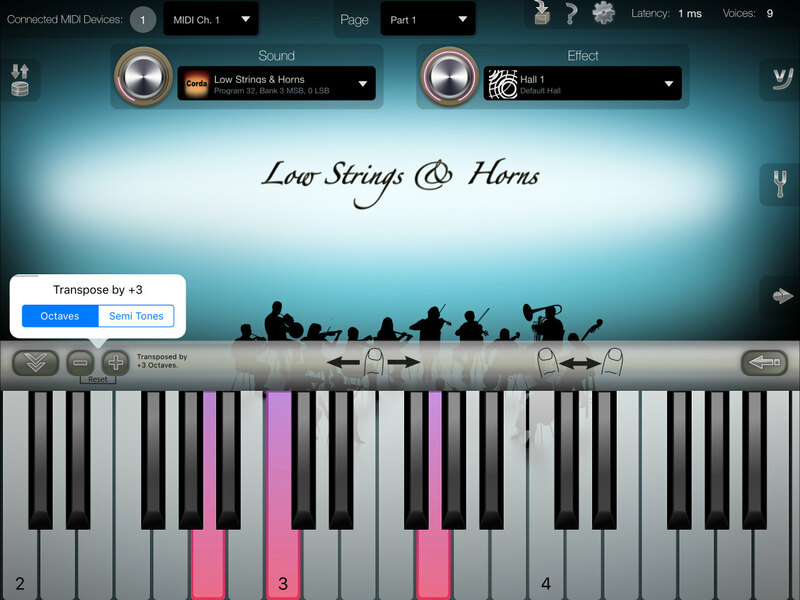 In the previous version the tuning screen automatically disappeared when touching the virtual MIDI keyboard. The app’s built-in MIDI recorder may not have all the features as a fully fledged DAW app, however the built-in recorder is a very handy way to save all your musical ideas. Especially since you don’t need to launch another app just for recording something. To share your recorded songs more conveniently, the built-in recorder now features an export functionality, which you can use to quickly send your song either as MIDI file, or as a pre-rendered audio file to your colleagues, friends, or for loading your songs to your cloud or app of your choice with just two taps. Also the metronome received some improvements. When tapping on the metronome button you can now directly alter the metronome’s click volume directly. So you no longer need to switch pages and go to the app’s settings screen just for adjusting this. Sometimes an audio click can be disturbing, especially when you are in a studio recording session. To avoid that, the metronome is now also visually indicated as you can see on this animation on the left. So you may completely turn off the audio click and still record in beat. iSymphonic 2 comes with our next generation audio engine. Apart from new features, it also fixes some audio issues that could have happened under heavy load before, and it now allows an audio latency down to as small as 1 millisecond. Support for Audiobus has been improved in iSymphonic 2 as well. For example it now also supports state saving directly within Audiobus 2 or higher. That way your entire iSymphonic setup is stored and automatically restored as snapshot along with your Audiobus session. The pitch range of the MIDI pitch bend wheel is pre-assigned by us for each individual sound. For the majority the default pitch bend range is ± 200 cents. Now you can also override the pitch bend range on the app’s settings screen. You may decrease it to only few cents, or rather increase it to a range of up to 2 octaves. Last but not least we consolidated the App’s info resources. So the most important resources like the App’s user manual or the feedback form, in case you want to get in touch with us, are now made available more clearly and easy from this new popup screen. The user manual and feedback form are now also displayed directly within the app. So it will no longer launch Safari and force you to switch back and forth between the two apps.